The Hungarian communities living in the neighbouring countries are striving to do the most possible for obtaining and constructing the necessary self-government necessary for their survival and prosperity as many other European national communities already did in the past. The Hungarian minorities have been fighting for their rights without violence, and Hungarian parties beyond the borders have always participated in democratic governments, not in non-democratic ones. The rights of self-government granted to minorities mean a good tool for the integration of modern and diverse societies. The Hungarian minority communities abroad believes that if the 3.5 million-strong historic Hungarian community in the Carpatian Basin is to survive, it must secure effective methods to preserve and nurture its unique cultural, ethnic, religious and linguistic identity. Territorial and cultural autonomy are such methods. Without a correct historical analysis and thorough understanding of the region, development of a coherent and consistent EU foreign policy is made more difficult and the solution finding toward Autonomy is almost impossible. 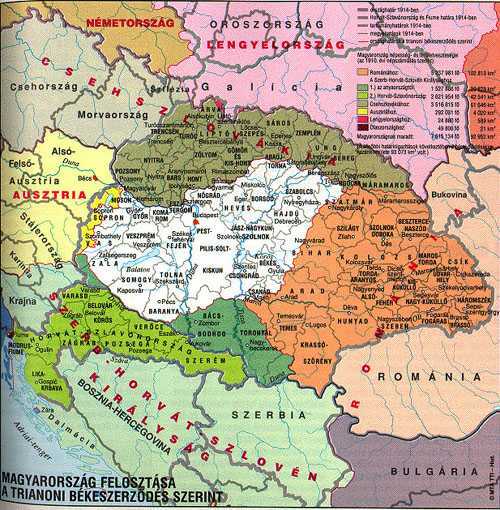 The division of history (Central and Eastern European history is often studied in three periods, pre-World War I, the Peace Years (between the wars), and Post-World War II, rather than as a continuous process of history) leads to poor analysis because it dismisses over a thousand years of historical development and nation building of Hungarians in the Carpathian Basin. Therefore we will take a short look of Hungarian communities' historical development since the settlement of Hungarians in The Carpathian Basin, in order to get a wide and comprehensive picture and better understanding for their calls for Autonomy. After the short introduction we will present some thoughts on Autonomy (Preface1, Foreword2, Recomendations3 untill the chapter of 'Positive aspects of autonomy'4) and some European examples (chapter: Diversity of forms of autonomy5) where Autonomous (self-governed) regions are a well functional part of those states. Although autonomy has been guaranteed by the Great Powers in 1920, again in 1945, and once more by the European Parliament, in 1993 (in Article 11 of Decision 1201), today, the over 4 million Hungarian minorities have no autonomy at all. On the 4th of June, 1920, the Treaty of Trianon was signed. Never before had a peace, imposed by violence, been more brutal in its bias, madder in its destructiveness, more forgetful of the lessons of history and better calculated to create future upheavals. The treaty cut mercilessly into the flesh of compact Hungarian populations. Hundreds of towns were separated from their suburbs; villages were split in two; communities were deprived of their parish churches or cemeteries; townships were cut off from their railroad stations and their water supplies. 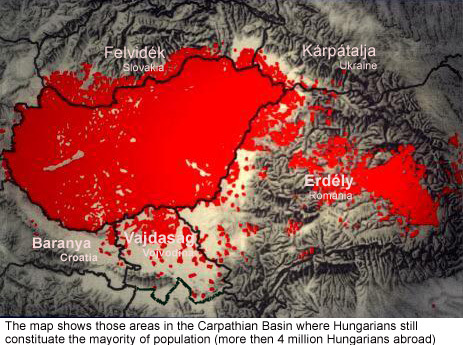 A 1000-year-old European country - Hungary was dismembered as its territory was reduced by 72%. In the process, 35% of all Hungarians were turned into foreigners within the towns built by their fathers, as the borders were redrawn around them. The new borders were not drawn on the basis of plebiscites (hungarians were not allowed to go to the polls) and did not follow ethnographic borders. In this way, the Hungarians became Europe's largest minority. These minorities were not emigrants who voluntarily left their old country, but people who never moved from their hometowns and became foreigners when borders were redrawn around them. For a thousand years, The Kingdom of Hungary occupied an oval shaped central plane surrounded by the protective bulwark of the Carpathian mountains. Like the crust on a loaf of bread, the mountains encased the lowlands in a majestic arch from which all waterways converge toward the center. This perfect geographic unity was matched by complete self-sufficiency, until this harmonious symbiosis of the great central plain and its surrounding mountains was destroyed in Trianon. The Year was 1920. For a millennium, Hungary was the eastern bastion of European civilization, a balancing and stabilizing power between Slavic and Germanic nations. Hungary's first king, Saint Stephen, wrote to his son, Saint Emeric, in 1036: Make the strangers welcome in this land, let them keep their languages and customs, for weak and fragile is the realm which is based on a single language or on a single set of customs (unius linguae uniusque moris regnum imbecille et fragile est.) Stephen's advice was respected and obeyed during the coming centuries: Hungary gave asylum to the Ruthenians in the north, the Wallachians (Romanians) and Saxons in the east, the Swabians and Serbs in the south. Eventually the kingdom posessed 14 nationalities, of which the Magyars were only one, and in order not to hurt the feelings of any, Latin remained the sole official language of the kingdom until 1844. 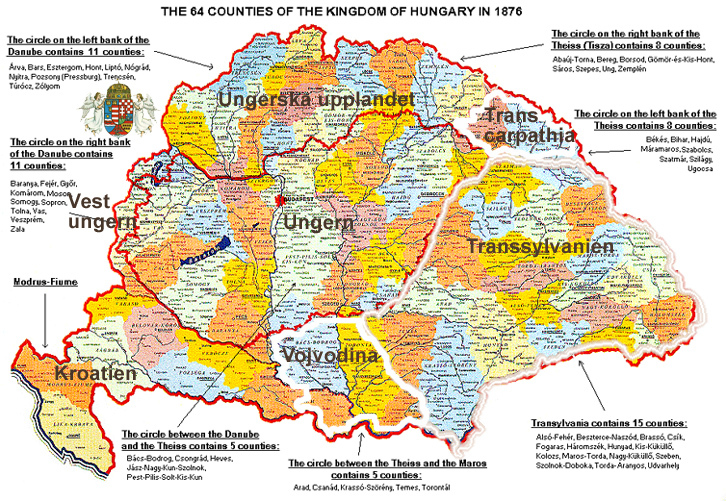 Hungary became a constitutional monarchy in 1222. Hungary's Golden Bull is junior by only 5 years to the English Magna Carta. This constitutional monarchy was almost completely annihilated by the Mongol invasion of 1240-41, but through that enormous struggle it succeeded in protecting Europe and her civilization. Toward the end of the XVth century, during the realm of the renaissance king Matthias Corvinus, Hungary's population reached that of England, the court in Buda became a cultural centers of Europe, and the library of Buda was Europe's finest. In 1526 Hungary was once again annihilated, this time by the Turkish invasion, which cut her population in half and the kingdom in three. During the 150 years of Ottoman occupation, the west was taken by Austria, the center by the Ottoman invaders and Hungarian culture survived only in the east, in Transylvania. Even today, Transylvania is the land where the purest Hungarian is spoken, where Hungarian popular art has found its most exalted, most perfect expression, and where Béla Bartók collected his Hungarian folk tunes. Transylvania is also the place where the Hungarian diet at Torda, in 1557, declared the freedom of religion for the first time in the world. Transylvania provided an atmosphere of religious and ethnic tolerance and as such became the birthplace of the Unitarian and Sabbatarian religions. After the Turkish occupation, Austria attempted to take over all of Hungary. This resulted in a series of uprisings. The fight for Hungarian independence of 1703-1711 was led by Francis II Rákóczy whose insurgent fighters were mostly Slovak and Ruthenian peasants, who proudly declared themselves to be Hungarians, as distinct from the racial term Magyar. The next fight for national independence was led by Louis Kossuth in 1848. The Ruthenian and Slovak nationalities once more contributed masses of recruits for the Hungarian revolutionary army, which, while defeated by the combined forces of Austria and Russia, forced the Hapsburgs to accept in 1867 the formation of an Austro-Hungarian duality. It was Kossuth who later proposed to convert the Austro-Hungarian empire (of 24 million Slavs, 12 million Germans and 12 million Hungarians at the time) into a Danubian Confederation. Kossuth was also the second foreigner ever invited to address the United States Congress in January, 1852. At the beginning of this century, Russia sponsored pan-slavic agitation in the region. Archduke Francis Ferdinand was the main opponent of the creation of a Greater Serbia. His murder on June 28, 1914 in Sarajevo had been encouraged by Russia and engineered by Serbia. The only member of the Council of Ministers of the Dual Monarchy who was opposed to the war of retaliation against Serbia was the Hungarian Premier, Count Stephen Tisza. When he was voted down, Hungary occupied Serbia and by 1915 would have considered the war over, if Russia did not have scores to settle with the Ottoman empire, France with Germany, Italy with Austria, and so forth. Therefore the war went on. During the war, the Czech allies of Serbia, Eduard Benes and Thomas Masaryk, transformed themselves from consultants of the allies into architects of allied policy for Central Europe. They organized a deceitful propaganda campaign for the dismemberment of Hungary and in their efforts succeeded in obtaining the support of two criminally ignorant French politicians, Georges Clémenceau and Raymond Pointcaré. President Wilson refused to cooperate in this conspiracy. He wanted Europe's new borders to correspond with her ethnographic boundaries and he wanted the principle of self-determination to prevail, but his views were disregarded. On January 24, 1919, he protested the illegal Serb and Romanian occupation of parts of Hungary and on March 31, 1919, he called the proposed dismemberment of Hungary absurd, but his objections were overruled by the French. As a result, the United States Congress refused to approve the Treaty of Trianon, but this product of Neronian insanity, this plan, unjust in substance and tragic in consequence, was implemented anyway. The very foundation of the 14 Wilsonian Principles was that people have an unalienable right to determine their own destiny. Yet at Trianon the application of self-determination and the use of plebiscites in drawing the new borders was totally disregarded. When the recommendations of one of the delegates to the Peace Conference, those of Field Marshall Ian Smith, to hold plebiscites in Transylvania, Slovakia, Ruthenia, Croatia and Slavonia were rejected, he was correct in declaring: "A plebiscite refused is a plebiscite taken." By not allowing plebiscites, the dismemberment of the Austro-Hungarian empire and the redistribution of her 48 million citizens resulted in the creation of 16 million oppressed ethnic minorities. These were not emigrants who voluntarily left their old country, but people who never in their life moved from their home towns and became foreigners, just because Clémenceau and Eduard Benes decided to redraw the borders around them. Although autonomy has been guaranteed by the Great Powers in 1920, again in 1945, and once more by the European Parliament, in 1993 (in Article 11 of Decision 1201), today, the over 3 million Hungarian minorities have no autonomy at all. Most present-day conflicts no longer occur between states but within states and are rooted in tensions between states and minority groups which demand the right to preserve their identities. These tensions are partly due to the territorial changes and the emergence of new states which followed the two world wars and the collapse of the old communist system, and also reflect the inevitable development of the concept of the nation-state, which, hitherto, viewed national sovereignty and cultural homogeneity as essential. Autonomy as applied in states governed by the rule of law can be a source of inspiration in seeking ways to resolve internal political conflicts. Autonomy allows a group which is a minority within a state to exercise its rights, while providing certain guarantees of the state’s unity, sovereignty and territorial integrity. Autonomous status may be applied to various systems of political organisation and means that autonomous entities are given specific powers, either devolved or shared with central government, while remaining under the latter’s authority. Most of the present conflicts can very often be traced to the dichotomy between the principle of indivisibility of states and the principle of identity, and are rooted in tensions between states and minority groups which demand the right to preserve their identities. The vast majority of European states today include communities which have different identities. Some of these demand their own institutions, and want special laws allowing them to express their distinctive cultures. Nowadays, particularly in view of developments in the practice of democracy and international law, States are faced with new requirements. States must prevent tensions from developing by introducing flexible constitutional or legislative arrangements to meet their expectations. By giving minorities powers of their own, either devolved or shared with central government, states can sometimes reconcile the principle of territorial unity and integrity with the principle of cultural diversity. The Council of Europe, which is committed to peace and to the prevention of violence as essential to the promotion of human rights, democracy and the rule of law, believes that the positive experience of autonomous regions can be a source of inspiration in seeking ways to resolve internal political conflicts. Many European states have already eased internal tensions, or are now in the process of doing so, by introducing various forms of territorial or cultural autonomy, embodying a wide range of principles and concrete measures which can help to resolve internal conflicts. These are: The Autonomy in Scotland, The Autonomy of Catalonia, The Autonomy of Sardinia, The Autonomy of Åland , The Autonomy of South Tyrol, Autonomous Region of the Azores (Purtugal). Autonomy, as applied in states respectful of the rule of law which guarantee their nationals fundamental rights and freedoms, should rather be seen as a "sub-state arrangement", which allows a minority to exercise its rights and preserve its cultural identity, while providing certain guarantees of the state’s unity, sovereignty and territorial integrity. The term "territorial autonomy" applies to an arrangement, usually adopted in a sovereign state, whereby the inhabitants of a certain region are given enlarged powers, reflecting their specific geographical situation, which protect and promote their cultural and religious traditions. Autonomous status may be applied to various systems of political organisation, ranging from straightforward decentralisation in unitary states to a genuine division of powers, either symmetrically or asymmetrically, in regional or federal states. In the past, autonomy was introduced in two stages, and originated in three ways, being established by regional entities when central states were founded, introduced to resolve territorial tensions, or sponsored by the international community. Autonomy is not a panacea, and the solutions it offers are not universally relevant and applicable. Autonomous status must always be tailored to the geography, history and culture of the area concerned, and to the very different characteristics of specific cases and conflict zones. With a view to relieving internal tensions, central government must react with understanding when minority groups, particularly when they are sizeable and have lived in an area for a long period of time, demand greater freedom to manage their own affairs independently. Successful autonomy depends on balanced relationships within a state between majorities and minorities, but also between minorities. Autonomous status must always respect the principles of equality and non-discrimination. All interpretation, application and management of autonomy shall be subject to the authority of the State, and to the will and judgement of the national parliament and its institutions. Positive discrimination, i.e. favourable representation in the organs of central government, can often be used to involve minorities more effectively in the management of national affairs. It is fundamental that special measures must also be taken to protect "minorities within minorities", and ensure that the majority and other minorities do not feel threatened by the powers conferred on an autonomous entity. In these autonomous entities, the Framework Convention for the Protection of National Minorities must also be applied, for the benefit of minorities within minorities. This increase in tensions can be partly explained by the profound changes that Europe underwent after the collapse of the old communist system in the 1990s. In the last few years, more than twenty new states have been established in central and eastern Europe. A state is generally composed of peoples (or communities) from different cultures. However, not every cultural community can establish a state to promote its cultural traditions, so every state must provide for and introduce flexible constitutional or legislative rules that allow these cultural differences to be expressed while safeguarding its unity at the same time. In the recent history of Europe, states have been created in three successive stages, namely after each of the two world wars and when the cold war ended. These pivotal stages were either marked by the creation of new states or the establishment of autonomous regions. Examples that illustrate this development are the autonomy granted to the Åland Islands in 1921 under the aegis of the League of Nations; to Alto-Adige / South Tyrol in 1947 under the authority of the UN and to Gagauzia (Moldova) in 1990 or the creation of the Autonomous Republic of Crimea (Ukraine) in 1992. Today, it seems that tensions in certain states that have been facing an internal political crisis for many years are being resolved with the aid of autonomy concepts. This appears to be the case in Cyprus or Sri Lanka. The Council of Europe, which wishes to contribute to finding peaceful solutions to all disputes, would like to know to what extent the positive experience of the autonomous regions can constitute a source of inspiration for conflict resolution. It may be observed that a number of states have dealt with their problems or are in the process of doing so by setting up territorial or cultural autonomies and that the latter offer a wide variety of principles, measures, ideas and concepts for resolving these issues. The concept of autonomy undeniably in some eastern european states has a negative, even threatening, connotation. In order to avoid any misunderstanding, it is important to state that our conception of autonomy does not in any way correspond to the use of the word in the past by authoritarian regimes like the Russian empire, the USSR or Yugoslavia. Our definition corresponds to the way the term is employed in democracies, i.e. states subject to the rule of law that guarantee specific rights and freedoms to their citizens. Democracy and the exercise of basic freedoms are essential for the success of autonomous entities. Autonomy is often seen as a threat to the territorial integrity of a state and the first step towards secession. However, it would be wrong to interpret it in this way. Rather, it must be considered as a compromise aimed at ensuring respect for territorial integrity in a state that recognises the cultural diversity of its population. Avoiding any recourse to violence, autonomy allows a minority group within a state to enjoy its rights by preserving its specific cultural traditions while providing the state with guarantees regarding its unity and territorial integrity. It represents an intermediate solution that makes it possible to avoid both the forced assimilation of minority groups and the secession of part of the state territory. Autonomy thus strengthens the integration of the minorities within the state and is a constructive element for the promotion of peace. It is necessary to emphasise the integrative potential of autonomy. Recent examples of its introduction, such as in Spain, Italy, Russia (e.g. the Republic of Tatarstan, Azerbaijan (the Autonomous Republic of Nakhichevan) or Moldova (the special status of Gagauzia), show that, as a system guaranteeing both respect for the cultural diversity of minorities and the preservation of territorial integrity, autonomy can represent a constructive solution to any real or latent conflict. Moreover, as calls for autonomy have become more frequent and are having a greater impact on the international legal order this issue needs to be examined in greater detail. Autonomy is a concept that presupposes the development of balanced relations in a state both between the majority and the minority and between minorities. If in the past the majority disregarded the identity and rights of minorities for a long time or resorted to violence to combat the aspirations of these minorities, the more difficult it will be to enter into a dialogue and envisage the grant of autonomy. In order to ease tensions, the central government must show it understands the minorities when they make precise demands concerning their rights to greater autonomy in the management of their affairs. This is particularly the case when these aspirations originate from numerically large minorities that have been living in a region for a long time. Positive discrimination, in the sense of the numerical overrepresentation of minorities in the central government bodies, is a way of involving the minority/minorities more in the management of national affairs. For example, in its Young, James and Webster judgment of 13 August 1981 the European Court of Human Rights urged positive discrimination when it stated that “democracy does not simply mean that the views of a majority must always prevail: a balance must be achieved which ensures the fair and proper treatment of minorities and avoids any abuse of a dominant position." (§ 63). Such a system is operated on a reciprocal basis for the Danish minority in the north German Land of Schleswig-Holstein, and the German minority living in the Danish frontier region. The concept of autonomy must be precisely defined since it has several meanings depending on whether a philosophical, political, cultural or legal approach is adopted. It is therefore necessary to distinguish between and clarify, by analysing their relations with one another, such concepts as federalism, decentralisation and regionalism. At the level of international law, the concept of autonomy refers to the rights of peoples to self-determination and to their freedom to manage their own affairs. In this context, it will be necessary to examine the application of these international principles in the national constitutional law. Autonomy, which represents the right of people to govern themselves by means of their own laws, allows certain territories to be granted the right to enact legislation and be given special powers that permit them to give expression to their distinctive historical, cultural and linguistic characteristics. The constitutions of most Council of Europe member states recognise the principle of territorial integrity and do not permit the right to unilateral secession. The principle of the indivisibility of the state must not be confused with its unitary character and it is therefore consistent with autonomy, regionalism and federalism. For example, the Spanish constitution states that “(t)he Constitution is based on the indissoluble unity of the Spanish Nation, the common and indivisible homeland of all Spaniards; it recognises and guarantees the right to autonomy of the nationalities and regions of which it is composed”. The Italian Constitutional Court has declared with respect to the special status of Trentino-Alto Adige (South Tyrol) that “the fact that the ethnic minorities living in this region can elect their own representative body under conditions of genuine equality can only be in the national interest and, indeed, national unity”. In Russia, the self-determination of the peoples of the Federation and the integrity of the Federation as a state are the basic principles of the legal order. Similarly, in Moldova section 1.1 of the organic law of 1994 defines the autonomy of Gagauzia as “territorial autonomy with special status (…) and forming an integral part of the Republic of Moldova”. This section states that “in the event of a change of the independent status of the Republic of Moldova, the citizens of Gagauzia shall have the right to exercise self-determination”. 29. Similarly, in March 1995, the Ukrainian Verkhovna Rada passed the law “on the Autonomous Republic of Crimea”, which defines the latter’s status as an autonomous administrative and territorial entity within Ukraine. Article 59 of the constitutional agreement of 8 June 1995 states that “the Autonomous Republic of Crimea is an autonomous administrative and territorial entity within Ukraine the powers of which shall be exercised within the limits laid down by the Ukrainian Constitution and legislation “. The term autonomy is ambiguous since it can refer to forms of organisation that range from simple decentralisation to regionalism and federalism, i.e. it represents an even or uneven division of power or of certain powers. There are various forms of autonomy in Europe based on the different political systems of which the autonomous entities form a part. Whatever its form, each state contains some elements of decentralisation. It can be said that there have been two historical phases with regard to the establishment of autonomy and that there are three different origins of autonomy: the autonomous bodies established by regional entities when the central state was created (as in the case of Switzerland), those set up to put an end to territorial tensions and those in which the division of powers has been initiated by international authorities, such as the League of Nations. The division of powers between the central state and the autonomous entity may be even or uneven. All the territorial authorities of a certain level of government, such as the cantons or Länder in a federal state and the regions in a regionalised state may enjoy autonomy. However, it is possible that only a specific part of the territory does so in the form of a special status with specific characteristics. For example, the Danish constitution confers such a status on the Faeroes and Greenland, while the Italian constitution gives specific rights to five autonomous regions with special geographical and linguistic features by granting them special status. Article 116 of the constitutional law of 18 of October 2001 states that “particular forms and conditions of autonomy are granted to Friuli-Venezia Giuliana, Sardinia, Sicily, Trentino-Alto Adige (South Tyrol) and Valle d’Aosta, in accordance with the respective special status adopted by the constitutional law”. In Europe, there are various forms of state that provide for some form of autonomy. In federal states, the federated entities have many delegated functions that allow them to enjoy, by virtue of an even division of power, considerable autonomy in the management of their affairs and have their voice heard by the federal organs. In principle, the entities that make up a federal state are all equal and have identical powers. The federal option is more a reflection of the various historical phases of the formation of a state (Switzerland, Germany, Austria), and respect for the oldest historical entities than of a concern to protect minorities. - Belgium, however, is a different case. In that country, the recent decision in favour of federalism was motivated by the desire to ensure the coexistence of different linguistic and cultural groups. The region is supposed to provide political, economic and social autonomy and the communities (francophone and Flemish) cultural autonomy. There are also regionalised states with autonomous regions. Regionalisation is in fact a form of decentralisation within a unitary state, with territorial entities enjoying a certain amount of autonomy in specific areas but supervised by a representative of the central state. This is the case with the Portuguese island territories of the Azores and Madeira, which have political and administrative statutes drawn up by the regional legislative assemblies and approved by the Assembly of the Republic. However, in the regionalised states there is very often an uneven division of powers. Spain and Italy are good illustrations of this. - In Spain, for example, during the process of restoring democracy after the dictatorship in what was a unitary authoritarian state, autonomy was originally conceived above all for the historical communities with their own specific identity, such as the Basques, Catalans or Galicians. However, the 1978 constitution went further by dividing the country into 17 autonomous communities. It defined the exclusive powers of the central government, with the communities able to assume all other powers. Each community thus has its own autonomy statute, which was adopted in the form of an organic law by the national parliament as the final authority, has the legal force of a local constitution for the community and determines the scope of the powers of the institutions and the extent of each entity’s own financial resources. Certain experts consider that the regional autonomous entities in Spain have developed in such a symmetrical manner that the country now has the structure of a federal state. - In Italy, the arrangements for territorial autonomy vary from one region to another. For example, Articles 5 and 6 of the constitution establish an actual link between regionalisation and the legal situation of the linguistic minorities. Article 5 provides: “The Republic, one and indivisible, recognises and promotes local autonomy; it shall apply the fullest measure of administrative decentralisation in services dependent on the State and adjust the principles and methods of its legislation to the requirements of autonomy and decentralisation”, while Article 6 states that “(t)he Republic shall safeguard linguistic minorities by means of special provisions”. Finally, there are also states that have undergone recent decentralisation with a delegation of powers, through legislation, from the central government to sub-national entities with specific cultural characteristics. This delegation has sometimes been accompanied by the creation of regions with a special status and extended powers. In the vast majority of cases they are island regions, such as the Faeroes, which belong to Denmark, Greenland following Iceland’s independence after the second world war, the French island of Corsica, which is recognised as a territorial entity with special powers, and France’s overseas departments and territories. As far as Corsica is concerned, it needs to be pointed out that the French government presented a draft statute for the island at the beginning of April 2003. It is planned to submit this text to a referendum among the population of the island on 6 July 2003. The text provides for the establishment of a single devolved authority, which would replace the present region and the two departments (Corse du Sud and Haute-Corse) but retain the local tier of government by setting up two “territorial councils”, one in the north and one in the south. This new statute also provides for the local Corsican assembly to be able to adapt the laws and regulatory provisions and for the general use and teaching of the Corsican language. However, this draft, the aim of which is to give Corsica more autonomy by means of a greater delegation of powers, falls short of the special status granted to several European regions (especially in Spain and Italy) that have much wider legislative powers. Nor does it go as far as the proposals made by Lionel Jospin, the former prime minister, who suggested a division of national sovereignty. The system of devolution, which is mainly employed by the United Kingdom, also takes account of the various communities making up the country by recognising the existence of separate legal systems in certain parts – i.e. Wales, Scotland, and Northern Ireland. In these areas of the UK, there is a very high degree of decentralisation with an uneven division of powers, resulting in the establishment of entities with broad autonomous powers administered by elected regional assemblies. Some British island regions, such as Guernsey, Jersey or the Isle of Man, have extremely broad autonomous powers in the management of their affairs. This process has been so successful that certain English regions, such as York or the Midlands, are demanding the same rights. This will be the subject of regional referendums to be held by the summer of 2003. Etymologically, the word autonomy is derived from the Greek auto (“self”), and nomos (“law”), so its primary meaning is the right to govern oneself and draft one’s own laws (i.e., “self-rule”). According to Kjell-Åke Nordquist, “an autonomy is a territory with a higher degree of self-rule than any other comparable territory of a State”. Cultural traditions, religious differences and particular geographical locations may justify granting specific powers to a particular territory. For Ruth Lapidoth, a leading specialist in autonomy, “Autonomy is a means for diffusion of powers in order to preserve the unity of a state while respecting the diversity of its population”. She distinguishes between three types of autonomy: territorial political autonomy, administrative autonomy and cultural or personal autonomy. - Administrative autonomy comes close to decentralisation. However, while the latter only involves a delegation of powers, the former presupposes a transfer of powers, which are exercised by the local elected representatives. - Cultural or personal autonomy is granted to the members of a specific community (ethnic, linguistic, religious), whatever their place of residence. This model of autonomy, which provides for the members of an ethnic community to be governed through institutions and/or their own legislation, allows minorities a significant degree of autonomy and cohesion, even when minorities are dispersed throughout the territory. The German professor Heinrich Oberreuter understands the concept of autonomy as “the possibility of free self-determination under an existing legal order”. According to Hurst Hannum and R. B. Lillich, two lawyers specialising in international law, autonomy could be perceived as “a relative term for describing the degree of independence that a specific entity enjoys within a sovereign state”. These different meanings of autonomy reflect the different ways in which a cultural minority can participate in the management of the affairs of the territory in which they live. In practice, these different forms of autonomy are very often intertwined. Autonomy-based solutions must be considered as “sub-state arrangements” that benefit a specific part of the population. It is consequently left to the national legislature to determine and give reasons for the interpretation, implementation and management of the autonomy. States and minorities should admit that, far from being final and static, autonomy status is a dynamic process and always subject to negotiation. Once a climate of confidence has been established, the central state will realise that the grant of autonomous power neither jeopardises its sovereignty and territorial integrity nor the existence of other minority groups, and it will be more willing to give the autonomous entity wider powers. In order to provide the right conditions for its permanence and stability, every autonomous entity must be integrated into a legal framework. A local autonomy status can be established by a constitution, a law, a regional statute or an international treaty. For example, certain autonomous entities have been set up exclusively by constitutional laws (such as the Faeroes, Greenland or the Spanish provinces), while others have been established by international agreements and then enshrined in constitutions (in the case of the Åland Islands, the Guarantee Act served to amplify and render more precise the League of Nations decision of 1921 which had been previously accepted by Sweden and Finland). Similarly, an Italian constitutional law of 1948 granting special status to Trentino- Alto Adige amplified and rendered more precise the De Gasperi- Gruber Agreement of 1946. Certain autonomous entities, as in the case of Spain, can also be set up by means of regional statutes adopted by the national parliament in the form of an organic law and then incorporated in the constitution. As regards the legal basis of autonomy status, it may be observed that when the autonomy is conferred on a significant part of the territory the special status is normally provided for in a text with the force of a constitutional law. This is clearly the case with the entities that make up a federal or regionalised state but it is also often true of regions that benefit from special arrangements within a unitary state. For example, the statute of the Autonomous Republic of Crimea is based on a special law of 29 April 1992, the adoption of which required the revision of Article 75 of the Ukrainian constitution. Since the legal basis of the autonomous regions determines the very structure of the state, it is preferable for it to be mentioned in the constitution. The aim of the report is to describe and analyse the cases of various autonomous regions by examining the way they function at the political and institutional levels. The study of the Åland Islands, Alto-Adige / South Tyrol and the Faeroes will enable the historical and political factors to be identified and a list to be subsequently drawn up of similar basic factors that emerge in the very different context of today’s conflicts. Sri Lanka, where the negotiation process is sponsored by Norway, is a current example of the relevance of these considerations and this historical experience. The study of the autonomous entities makes it possible to draw up a list of the factors conducive to the lasting success of selfgoverning regions. Every demand for autonomy takes place within a historical context with cultural, political, democratic and geopolitical dimensions. This wish for autonomy can be explained by reference to specific cultural traditions, a specific language, a feeling of belonging culturally to a neighbouring country or the particular makeup of the territory concerned. There are also key historical factors. For example, very often the country that has accepted an autonomy agreement was itself in the process of being constituted, while in other cases, the autonomy may have been supported by a neighbouring state and/or the international community. As regards geopolitical criteria, it can be said that in many cases the autonomous entities do not possess any significant natural resources and are not of major strategic importance and the big powers are not directly involved in any conflict there. Finally, the success of the autonomous entity depends to a large extent on respect for human rights and democracy in the neighbouring country and on the renunciation of force. Respect for the principles of “good governance” and the grant of autonomous powers are favourable conditions for ensuring the permanence of the autonomy agreements. Hungarian minority communities in Romania, Slovakia, Serbia, and Ukraine have served as important catalysts for regional stability and democratization in post-communist Central Europe. Ethnic Hungarian political parties in the region have supported power-sharing arrangements in order to promote Western democratic values and to assume responsibilities for governance beyond their own particular interests. Their autonomy proposals aim to protect ethnic identity and to strengthen local democracy and self-governance within the existing state structure. The Hungarian minority communities abroad believes that if the 3.5 million-strong historic Hungarian community in the Carpatian Basin is to survive, it must secure effective methods to preserve and nurture its unique cultural, ethnic, religious and linguistic identity. Territorial and cultural autonomy are such methods. Without a correct historical analysis and thorough understanding of the region, development of a coherent and consistent EU foreign policy is made more difficult and the solution finding toward Autonomy is almost impossible. The division of history (Central and Eastern European history is often studied in three periods, pre-World War I, the Peace Years (between the wars), and Post-World War II, rather than as a continuous process of history.) leads to poor analysis because it dismisses over a thousand years of historical development and nation building of Hungarians in the Carpathian Basin.Therefore we will take a short look of Hungarian communities' historical development since the settlement of Hungarians in The Carpathian Basin, in order to get a wide and comprehensive picture and better understanding for their calls for Autonomy. The Hungarian national community indigenous to Transylvania is committed to its centuries-old traditions of autonomy. The democratic means (necessary to guarantee full and genuine equality for all Hungarians of Transylvania) consist of forms of autonomy which, in accordance with historical, geographical and demographic conditions, provide decision-making authority, rights and institutions by which the Hungarian national community can exercise self-government at the territorial and individual (“personal autonomy”) levels, and through special-status local government bodies. Arrangements securing territorial or cultural autonomy date back to the Middle Ages in Transylvania and this tradition has inspired the present-day aspirations of the Hungarian minority community. More than a decade ago, at its delegates’ assembly held on October 25, 1992 in Kolozsvár/Cluj, the Democratic Alliance of Hungarians in Romania adopted autonomy as part of its political program. At a meeting on July 5, 1996, representatives of ethnic Hungarian organizations, the Hungarian government, and Hungary’s political parties unanimously endorsed the concept of autonomy. The government’s agenda for education in minority languages (The Amendments to the 1995 Act on Education) included amendments to the Education Act and the Local Administration Act and the adoption of a comprehensive Minority Act. However, faced with a divided parliament and a hostile Romanian media, and with strong opposition from within, the government eventually only achieved the revision of the Education Act. Revising the Education Act became a difficult endeavour due to the great challenge posed by the RMDSZ to its Romanian allies: the demand for a Hungarian-language, state-funded university in Transylvania. The status of Babes–Bolyai University in Cluj lay at the centre of the debate. Traditionally a Hungarian-language university, the Bolyai University was merged in 1959 with the Romanian-language Babes University. Under communist rule, the Hungarian sections of the newly formed Babes–Bolyai University were gradually subordinated and the Hungarian teaching staff eventually lost any meaningful power in the university’s governing body (PER, 1997). Since 1989, the restoration of the Bolyai University has become, along with the more general debate over autonomy, the issue that has maintained the dividing line between Romanians and Hungarians in Romania. The re-establishment of a Hungarianlanguage university has acquired a symbolic signifficance to both communities. To the Hungarian community, autonomous control over a higher education institution of its own is more than an issue of rights. Rather, it is a matter of cultural survival and of recognition of the intellectual worth of the Hungarian community in Romania. To the Romanian majority, such an arrangement is unfortunatelly seen as the first step towards ethnic separation and ultimately a threat to the territorial integrity of the Romanian state (Nastase, 1998). A legal solution to this problem was offered in the amendments to the 1995 Education Act. The text was the result of a compromise between the positions of the two parties and attempted to resolve the issue within the state/private education scheme. Thus, the law “acknowledges” the right of persons belonging to national minorities to establish and manage their own ‘private’ universities (Article 123). The most controversial issue remained, however, minorities’ access to education in their mother tongue at state universities, which is a long-standing demand of the Hungarian minority. The law therefore also grants minorities the right to “request” the establishment of groups, sections, faculties and departments with instruction in minority languages “within” the existing state universities (Article 123) or the establishment of “multicultural”, that is multilingual, state universities. Finally, entrance and final examinations can be taken in a minority language at educational institutions where tuition is offered in that language. However, the establishment of monolingual higher education institutions in languages other than Romanian remains an unresolved problem for the Hungarian minority. This is because many Hungarians see the multicultural university compromise as a temporary solution to their wider need to preserve their language and culture. The Hungarian demands for the state funded University on Hungarian language, are legitimate and not a rare or non-european example. The swedish minorities living in the island of Åland (belongs to Finland) have they own university, Catalonians and for example South Tyrolians has it too. The Romanian government eventually has to recognazie and accept this legitimate demand of the Hungarian community in Romania, and as a state knocking on the doors of EU these issues must be adressed and the legitimate demands fullfilled, as part of common European Community values toward the peaceful coexistence of national minorities and governing majorities. All the Hungarians abroad believes that efforts to promote autonomy by the Hungarian National Council of Transylvania and the Székely National Council are reasonable, timely and necessary. As longstanding, strong supporters of the EU foreign policy goal to promote stability and democracy in Central and Eastern Europe, we call upon European policy makers to urge Romanian leaders to recognize and act in a timely manner to fulfill the legitimate demands of the Hungarian national minority. Autonomous institutions for the purpose of promoting minority language, culture, education and political representation are familiar in many regions of Western Europe, and are endorsed by the Council of Europe. We call upon European institutions, the democratic states of Europe, and Euro-Atlantic institutions and states to support our plans to achieve autonomy at every level, including territorial autonomy for the Hungarian Székely community [in eastern Transylvania], the principle of personal autonomy, and local self-governments having specific legal status. It is our conviction that achieving legal recognition of the various forms of community autonomy will guarantee full and genuine equality among citizens, creating an environment in which the numeric majority and minority communities can develop relations free of tensions, and contributing to the strengthening of stability which is necessary for the country’s advancement toward the European Union. The phrase "Hungarians of Slovakia" or, the one used earlier, "Hungarians of Czechoslovakia" is a notion and a reality of the twentieth century. Prior to 1918, the segment of the Hungarian nation now inhabiting Slovakia has been in its ancestral homeland for more than a thousand years. This population did not leave their native land, but rather had an imposed border change, sealed against their will at the Treaty of Trianon in 1920 and the Treaty of Paris in 1947. At the time of the first border modification in 1919 the Hungarian population of today's Slovakia was 693,000 representing 23,5% of the total population of the country. 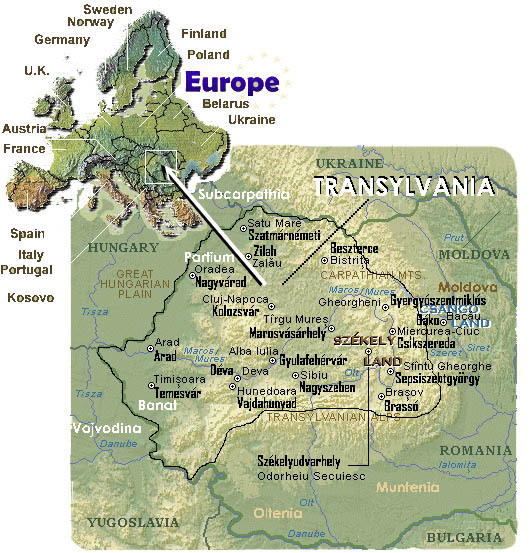 In 1991, the Hungarian speaking population of Slovakia was 608,000, representing a 11,2% of the total population. In recent years there were, however, two positive developments in the Slovak legal framework from the perspective of the autoctonous Hungarian population. One was the official recognition of the spelling of Hungarian names 7 and the law allowing for the Hungarian language designation of communities or jurisdictions. 8 Both of these issues were settled because they were requirements prescribed by the Council of Europe at the accession of Slovakia to that body in 1993. 9 The actual fulfillment of these requirements, however, have fallen short of the expectations of the European Council. 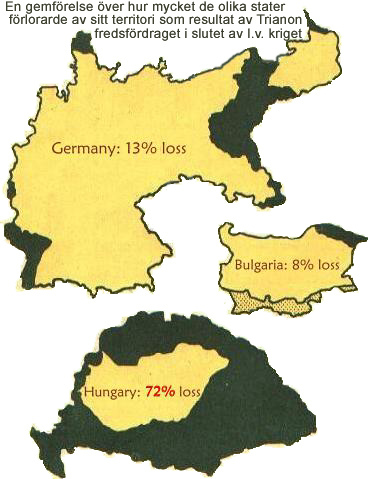 There are other sources of disappointment to the expected standards, namely the continued economic discrimination against the Hungarian minority stemming from regulations put into place against the Hungarian minority between 1945 and 1948 because of their so called "collective guilt" against the Slovak nation. 2. Administrative jurisdictions of Slovakia were geographically modified in a clear case of gerrymandering. The administrative system governed by laws created in 1991, included 17 primary jurisdictions and 2 secondary jurisdictions, with a majority Hungarian population. 11 The 1996 law eliminated this system of administration. 12 In the reorganized system only 2 primary administrative jurisdictions have a Hungarian majority population. Furthermore, 8 secondary administrative jurisdictions were created, 5 with Hungarian populations in the 10 to 30 per cent range. In 1998, these jurisdictions will have regional self governing communities, where the diminished proportion of Hungarians makes certain they will play a subordinate role in self government. 3. The Slovak parliament approved a law granting a special legal status for Matica Slovenska, an ultranationalist organization, to exercise certain administrative jurisdiction over ethnic matters, the possibility of intervention in the cultural life of the non-Slovak population as well as in educational matters related to them. Furthermore, the law provides for this chauvinistic organization the right to create as many legal entities as required to fulfill the objectives of the organization. 13 Currently, Matica Slovenska oversees a budget constituting 5% of the total Slovak budget for cultural affairs, that is, 145 million Slovak crowns. At the same time, the Hungarian population of Slovakia, which is over 10% of the total population, receives a negligible budgetary allocation for cultural matters of approximately 0.1%. 4. A law regulating the rights of non Slovak citizens of Slovakia was passed. This is the first racist law of Slovakia since the regulations passed after World War II against the Hungarian minority legalizing the deprivation of their rights. 14 This law specifies that in order to gain Slovak status abroad an individual has to have proof of Slovak ethnicity going back for three generations. This means that a person, or descendant, though born in Slovakia and now living in another country, unless he or she is not of Slovak origin, that is, not an ethnic Slovak, by virtue of this law is placed at a disadvantage. This has serious implications regarding access to employment and inheritance. In communities where the Hungarian community exceeds 40% of the total population the teachers of Slovak schools receive supplementary pay. The impending public education bill also reflects the same discriminatory qualities. All indications point to the dawn of an era of nationalist dictatorship in Slovakia. Responsibility for this is not solely attributable to the Government of Vladimir Meciar and the ruling governmental coalition, since the laws were also approved by a significant segment of the opposition in the Slovak parliament. A policy which tramples on the rights of national minorities finds wide consensus not only in Slovak political life but also in Slovak society. This constitutes a roadblock in the creation of a democratic Slovakia. Proof of this was also shown in the parliamentary vote following the signature of the basic treaty between the Republic of Slovakia and the Republic of Hungary, where lawmakers including Slovak opposition members signed on to the treaty provisions only with attached restrictive parliamentary declarations. The basic treaty remains unpublished to this day in the statute books, even though the ratification of the treaty took place more than a year ago. Another source of impediment for the reconciliation of Slovak and Hungarian society is that each views the past, present and future differently. Regarding the past, there is practically nothing to agree on. There was ample evidence of this when in 1996 the Hungarians commemorated the 1100 anniversary of the foundation of the Hungarian state and the Slovak state apparatus, at the initiative of the opposition and with public opinion approval, could launch attacks against Hungarian celebrations and memorials. In terms of the present, a consensus may be possible with those Slovaks opposed to the current government policy, to the attacks of the Prime Minister against the President, and to the continuous infringement of parliamentary democracy by the government coalition, and to the methods of the privatization process. Regarding the future, the most noticeable difference is the fact that the Slovaks cannot accept the Hungarian perspective for the future of their community. The image Slovaks have of the Hungarian community and the image of the Hungarian community of itself also differs sharply. Generally speaking, Slovaks consider the Hungarians as a national minority, significant segments of Slovak society even view the Hungarians either as intruders or Magyarized Slovaks, who endanger the Slovak national identity. At the same time, the Hungarian community is aware that they live in their ancient homeland, are socially and politically well organized and do not portray themselves as a national minority. Although Hungarian political platforms do not reject the Slovak state, neither did they support its inception before 1993. The Hungarian members of parliament did not vote either for the declaration of independence or for the Slovak Constitution, because both documents include emphasis on Slovak ethnic nationality. The Slovak state came into existence equally without the participation or aspiration of the Hungarians as did Czechoslovakia in 1918 and 1945. The Hungarian community accepts as a reality the fact that their historic and native land is now in a country that shows enemity towards the community. The Hungarians' way out of this dilemma is to pursue European integration while promoting cooperation with those Slovaks capable of reaching common ground on certain issues. — the consistent application of the principle of subsidiarity in the spirit of the European Charter of Local Self-Government. Of these three concepts so far none has found favour in the Slovak political world. NOTES: * 1. Constitutional Charter for the protection of national, religious and ethnic minorities, Constitutional Law number 121 of 1920 in the Collection of Laws. * 2. Legal framework for the rights of language use in the Republic of Czechoslovakia Collection of Laws of 1920, number 122. Government decree attendant to the implementation of the Language Law; Collection of Laws 1926, decree number 17. * 3. Collection of Laws of 1976, number 126 and proclamation number 53 of 1993. * 4. Constitution of the Slovak Republic, Collection of Laws of 1992, number 460. * 5. Constitutional law of the status of Nationalities of the Czech and Slovak Republics; Collection of Laws of 1968, number 168. * 6. Constitutional Charter pertaining to fundamental rights and liberties. Collection of Laws of 1991, number 23. * 7. Law pertaining to the Surnames and Family Names. Collection of Laws of 1993, number 300. Law pertaining to Birth Certificate Records. Collection of Laws of 1994 number 154. * 8. Law pertaining to the Display of Community Names in the Language of the National Minorities. Collection of Laws of 1944, number 191. * 10. Language Law of the Slovak Republic. Collection of Laws of 1996, number 270. * 11. Law pertaining to Local Administration. Collection of Laws of 1990, number 472. Law pertaining to the territorial and administrative jurisdictions. Collection of Laws of 1990, number 517. * 12. Law pertaining to the territorial and administrative reorganization of the Slovak Republic. Collection of Laws of 1996, number 221. * 13. Law pertaining to Matica Slovenska. Collection of Laws of 1997, number 68. * 14. Law pertaining to Slovaks Living Abroad. Collection of Laws of 1997, number 52. * 15. The circular issued by Undersecretary Ondrej Nemcok cites governmental decrees of the Slovak Republic, numbers 459/95, 768/95 and 845/95. Vajdaság/Délvidék (Vojvodina) was a part of the kingdom of Hungary, since the foundation of Hungary in 1000., a.d by St. Stephen first christian king, untill the asignment of Trianon peace Treaty in Paris 1920. Vojvodina is a region of East Central Europe that has been neglected in the news media and in public policy discussions. In spite of this neglect, events on the ground there have reflected many of the same problems and concerns as those, which led to the conflict in Kosovo, Bosnia, Croatia, and other parts of the former state of Yugoslavia. Consequently, the situation in Vojvodina carries the same potential danger as the ones which led to "ethnic cleansing" in these regions. Between 1867 and the end of the Great War, the three ethnic groups lived in the area later to be called the Vojvodina in more or less balanced proportions. According to the last Hungarian census, (1910), of a total population of about 1.5 million, 457,000 (30 per cent) were Hungarian, 384,000 (25.6 per cent) Serbian, and 323,000 (21.6 per cent) German. Other smaller ethnic groups were 56,000 Slovaks (3.8 per cent), 74,000 Romanians (4.9 per cent), and 13,000 Ruthenians (0.9 per cent). Of the towns, Szabadka (Subotica) with a population of 100,000 and, primarily, the northern Bácska towns had a Hungarian majority. Serbs dominated the southern part of the region, whereas Germans were dispersed over the whole area. During the late 17th and into the 18th centuries, the Habsburgs encouraged Ottoman Serbs and people from throughout Central Europe to settle in what is now Vajdaság/Délvidék (Vojvodina), which Habsburg forces had recently retaken from the Turks. The region became an ethnic mosaic and remained so through 1945, but its large German minority was expelled at the end of World War II, and many of the region's Hungarians fled or were deported at the same time. Vojvodina's Serbian population grew with Belgrade's support in the interwar years and under the communist era of president Tito. Large numbers of South Slavs - Serbs, Macedonians and Montenegrins - were settled in the area in the inter-war period. World War II provided a second opportunity for ethnic cleansing, under the pretext of eliminating the guilty "collaborators" of Nazi Germany. The Swabian Germans were held collectively guilty and massacred in large numbers and expelled en masse during the autumn of 1944. They were replaced by Serbs and other South Slav colonists, mainly from the Krajina regions of Croatia and Montenegro. By 1948 the Serb proportion of the population grew to 50.4 percent while the Hungarian share declined to 26.1 percent and the Swabian-Germans did not even show up in the population enumerations. These first two waves of "ethnic cleansing" did not receive publicity because Yugoslavia was a member of the Allied coalition that helped defeat Hitler. However, it is very disheartening, that this silence continued all the way to the present, and little or nothing has been said in the West about the third wave of "ethnic cleansing" that has just taken place in the 1990's. According to the 1991 census 56.8 percent of the population was composed of Serbs in Vojvodina as against 16.9 percent of the Hungarians. Almost overnight, the wars in Croatia and Bosnia brought new waves of refugees to Vojvodina. Since the Dayton Accord was signed 257,739 refugees settled in Vojvodina. Of these 94 percent are Serbs. This has lowered the Hungarian proportion in the over all population to 12.9 percent, while it has increased the Serb ratio to 64.3 percent of the total population (which at the present time is estimated to be 2,213,000). Vojvodina has been the favorite re-settlement location of the Serbian refugees. This is no accident; this is simply the result of the continuation of an aggressive policy of Serbianization. Of all the Serb refugees who have been resettled in rump Yugoslavia, 47 percent have been settled in the Vojvodina, 25 percent in Belgrade and its suburbs, 25 percent in the rest of Serbia, and 3 percent in Kosovo. Furthermore, of those who have settled in the Vojvodina, the overwhelming majority has indicated that they want to remain there. Only 8.8 percent have said that they want to return to their former homes in Croatia or Bosnia-Herzegovina. During the rule of former Serbian and Yugoslav President Slobodan Milosevic from the late 1980s to 2000, many Croats, Hungarians, and other people of central European origin left Vojvodina, but the area was generally spared the forced ethnic-cleansing campaigns Belgrade employed elsewhere in the former Yugoslavia. Milosevic is still a hate figure in Vojvodina. Until he abolished it in 1989, the northern region, bordering on Hungary, enjoyed an autonomy granted by Tito's successive constitutions. Vojislav Kostunica, the former president of Yugoslavia and the winner of the first round of elections for the presidency of Serbia has replaced the deposed autocrat as chief villain. The large Hungarian community, 350.000 people - one eighth of Vojvodina's two million strong populace - petitioned for self-rule in locales with a hungarian majority. In January-February 2001 and again in January-February 2003, the Serbian parliament restored some of the territory's previous powers and privileges - over its finances, agriculture, health care, justice, education, tourism, sports, the media, and social services. Vojvodina is not only Serbia's bread basket, it also harbors its nascent oil industry, and many of its blue-chips. As a result, it is a net contributor to the federal budget and subsidizes the other parts of Serbia-Montenegro. It produces two firth of Serbia-Montenegro's dwindling GDP and attracts two thirds of its foreign direct investment - with only one fifth of its population. Like Scotland and Flanders, northern Italy and Quebec, Vojvodina would like to retain a larger share of its resources for local consumption and investment. In a "Europe of regions" and a world of disintegrating nation-states, this was to be expected. In August, the Committee for International Cooperation and Relations with Euroregions of the Vojvodina parliament voted to join the Assembly of European Regions (AER). Vojvodina's parties are members of the ruling, Western-orientated, formerly Djindjic-led, coalition in Belgrade. The Vojvodina Reformists, who backed Kostunica in the recent bout of elections, have teamed with a DOS breakaway faction to form a new, left of center, political force. Vojvodina plays a crucial role in Serb politics. The leader of the Alliance of Vojvodina Hungarians - VMSZ, admitted to the Serbia-Montenegro daily "Dnevnik", that the status of the Hungarian minority is improving "step by step", though "Hungarians are still not adequately represented in the judiciary, prosecutions, in leading positions in the economy." In an inversion of the traditional roles, the Beta news agency reported that Vojvodina's secretary for culture and education, Zoltan Bunjik, announced a series of assistance programs targeted at the Serb minority in Hungary, including a Serb history and culture curriculum. Despite historical conflicts, some traditions of co-existence between peoples, cultures and religions evolved in this area of mixed ethnicity (Hungarians have been Roman Catholic or Calvinist, the Germans Roman Catholic, the Serbs Greek Orthodox). Co-ordinating respective interests, and a routine of co-existence among Hungarians, Serbs, Germans and Romanians used to be general in the historical southern territories. Similar ways of life, whether peasant, middle-class or professional, led to communal, neighbourhood and trade connections between the various ethnic groups. In peacetime conditions, such connections created strong social bonds. After the fighting ceased in 1849, up to the Great War, a degree of tolerance and cooperation among the co-habitant ethnic groups and their educated layers defined everyday social life. This is testified in literature, by the works of Dániel Papp, Ferenc Herczeg, Izidor Milkó and Elek Gozsdu writing in Hungarian, or by Zmaj Jovan Jovanovic, Jakov Ignjatovic and Vejko Petrovic writing in Serbian. Whenever these traditions, so promising and always supporting the cultural (and mental) integration of the Central European region, were in jeopardy, the invariable cause was political nationalism. Especially at the neuralgic points of history, in times of war, political nationalism has destroyed much that everyday life and cultural development produced. Hungarian and Serbian political strategists have ordinarily prepared their plans in opposition to each other and refused to avail themselves of the advantages of a structured coordination of interests that everyday life in the community, rural or urban, has shaped. There were exceptions, naturally. The noted politician and advocate of Hungarian sovereignty, Endre Bajcsy-Zsilinszky, published a book entitled Helyünk és sorsunk Európában (Our Place and Future in Europe) in 1941, not long before the German invasion of Yugoslavia, a book which was banned at the time, and has not been reprinted to this day. In it, he argued in favour of a strategic alliance between Hungarians and South Slavs. This proposal served to underpin historically and politically the Hungarian-Yugoslav treaty of friendship made under the premiership of Count Pál Teleki. The treaty was swept aside by history, just as were its initiators - Count Teleki committed suicide three days before the German invasion in protest against Hungarian participation in it, and Bajcsy-Zsilinszky was executed in 1944 by the Hungarian henchmen of the Nazis. Anti-minority violence surged in the province of Vojvodina in the period since January 2003. Numbering 350.000, and comprising 14 percent of the population, ethnic Hungarians are the largest national minority in this multi-ethnic region. Particularly troubling is a seemingly coordinated series of “legal” measures to incapacitate key leaders of the Hungarian community, including the “preliminary” detention since April 26, 2005 of Gabriella Ágoston for alleged transgressions a decade ago, and threats to incarcerate the President, vice-president and other leaders of the Vojvodina Alliance of Hungarians, the minority’s strongest body. - Threats against minority leaders. f) Guaranteeing the independence of the media, and training for those working in the media, laying particular stress on the concept of inter-ethnic relations and living together. Unfortunately, despite the increasing frequency and intensity of incidents, the Serbian government has not yet implemented these recommendations. However, the extensive reforms needed, as indicated, cannot take place without Serbian government cooperation. Consequently, in order to ensure the safety of minorities in Vojvodina, sustained attention and further involvement on the part of the EP and other governmental institutions is necessary. A long-awaited step in the right direction occurred recently at the provincial level. On June 14, 2005, the Inter-Ethnic Relations Committee of the Vojvodina Parliamentary Assembly released a detailed report confirming the fact that the number of ethnically related incidents is increasing and grew drastically between 2003-2005. According to the report, there were 178 “inter-ethnic” incidents in 2003 and 2004. In 82 cases, the victims were ethnic Hungarians; in 19, Croatian; in 15, Serbian; in 14, Albanian; in 12, Roma; in 7, Jewish; in 6, Slovak; in 3, Ruthenian; in 2, Ashkali; and there was 1 case each involving the Bunjevac and German nationalities. The report notes that there were six cases where the assault involved all of the minorities, and nine cases where they could not identify the targets of the abuse. Racial discrimination: once in 2003. (4) often blame the victims for provoking the attacks. The clear anti-Hungarian bias exhibited by the Serbian police force, is an enormous impediment to ending the anti-minority violence. The lack of action against perpetrators of anti-minority violence in effect condones its existence, by eliminating the criminals’ fear of punishment. Instead, members of the ethnic majority are visibly allowed to exercise aggression against minorities and thus perpetuate the cycle of violence, without fear of retribution by the authorities. From all this we find that at the national, provincial and local levels, sufficient political will and commitment to swiftly investigate and prosecute the perpetrators of violence; address the issue of ethnic bias in law enforcement and judicial sectors; curb and prevent future incidents; and formulate and implement a comprehensive strategy to promote tolerance is still lacking. As a minimum the the Vojvodina Alliance of Hungarians and all Hungarian parties in Vojvodina call for an acceptance of the autonomy aspirations of the Hungarians in the Vojvodina. It is no longer enough to grant autonomy to the Vojvodina as a whole. During the past eleven years the region's demographic profile has been completely transformed, making the Serbs - through an aggressive colonization process - the overwhelming majority (64.3%) of the entire province. The autonomy concept must be revised to also apply separately to the northern one-fourth of the province. Autonomy, local self-government must be granted to this sub-region.